When aliens misinterpret video-feeds of classic arcade games as a declaration of war against them, they attack the Earth, using the games like PAC-MAN, Donkey Kong, Galaga, Centipede and Space Invaders as models for their various assaults. 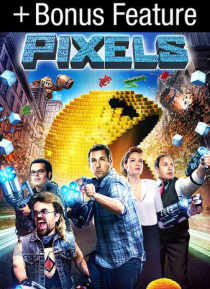 President Will Cooper (Kevin James) has to call on his childhood best friend, '80s video game champion Sam Brenner (Adam Sandler) to lead a team of old-school a… rcaders (Peter Dinklage and Josh Gad) to defeat the aliens and save the planet. Includes a bonus featurette.